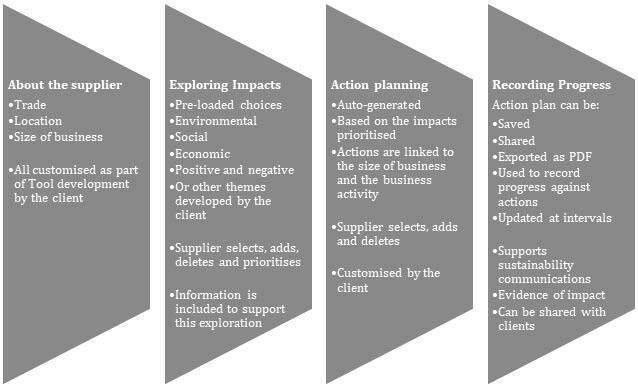 The NETpositive Supplier Engagement Tool was developed by NETpositive Futures Ltd with support from the Stockholm Environment Institute. Note: In order for the Tool (and the associated data) to be used to its full potential suppliers are encouraged to return to their Action Plans periodically and update progress and evidence against their actions. This aligns with our belief that sustainability is about continuous improvement that reduces negative impacts as well as enhancing positive impacts. An individual company Action Plan is therefore best considered a ‘living document’. There are a range of benefits from utilising the Tool for all parties involved. Prepare for contract management discussions relating to sustainability. Contact us by calling 01723 850535 or by emailing admin@netpositivefutures.co.uk if you would like to find out more about the Tool.